Revue Psychologique de l'Afrique du Nord / Revue Mensuelle. Organe de la Societe Algerienne d'etudes Psychiques. Algiers, Algeria. Language: French. Publisher: Societe Algerienne d'etudes Psychiques. 1/1, January 1906-n.s., 9/12, December 1914. 18-24 pp., 5-6 francs a year, free to members. The Societe Algerienne d'etudes Psychiques was formed by the union of the Federation Algerienne et Tunisienne des Spiritualistes Modernes and the Groupe Spirite Beranger. The journal was a local spiritist effort that over time increasingly turned to the more respectable field of psychical research. 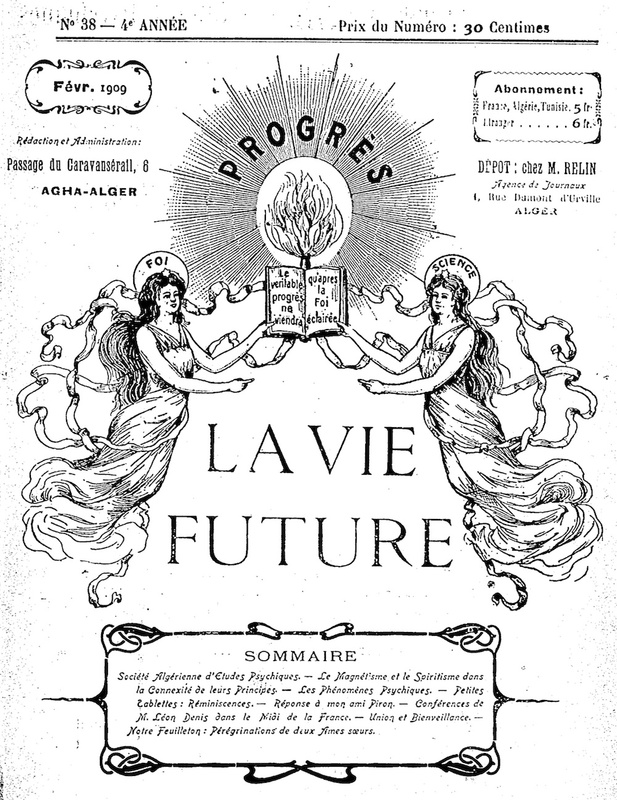 It featured the communications obtained by the Groupe Beranger and others from local mediums in Algiers, with occasional articles on the Fox Sisters, mechanical writing, Buddhism, prognostication, magic, and the like, and the serialization of novelettes like Les peregrinations de deux Ames soeurs, and Un Mage Blanc, Roman occulte, received by a writing medium. BNF.